I don’t think it’s a coincidence that for the past few years, right around this time in January — just after the holidays, when the cold is burrowing deep into our bones and our next vacation feels far far away — is when we sit at the kitchen table, four laptops open to google maps, calendars, camp websites and Orbitz, and plan our Big Summer Trip. Three years ago it was Amsterdam, two years ago it was Hawaii. And last year, it was ten glorious days in Sicily, via Rome. Six months later, I’ve finally gotten my act together to share some highlights from that vacation. 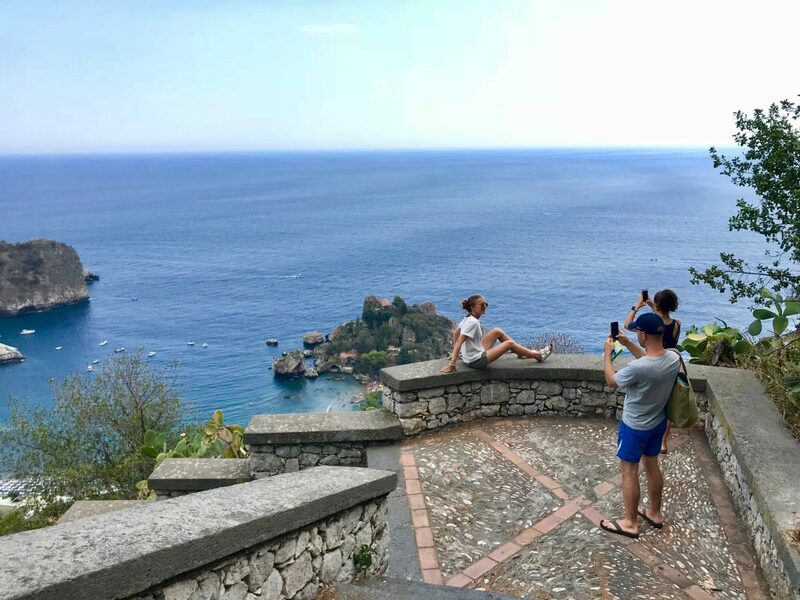 We flew into Palermo from Rome, rented a car, and drove straight to Taormina (a little over 3 hours) where we stayed in an Airbnb for days 1-3. 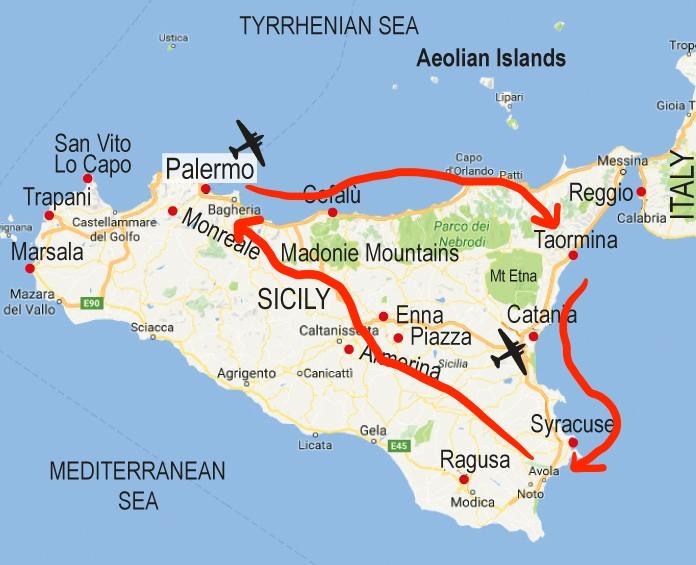 (Yes, it would’ve made much more sense to fly into Catania instead of Palermo. Long story.) Next, we drove two hours along the coast (with a stop in Brucoli, near Catania) to Avola, our home for days 3-9 (again, in an Airbnb). 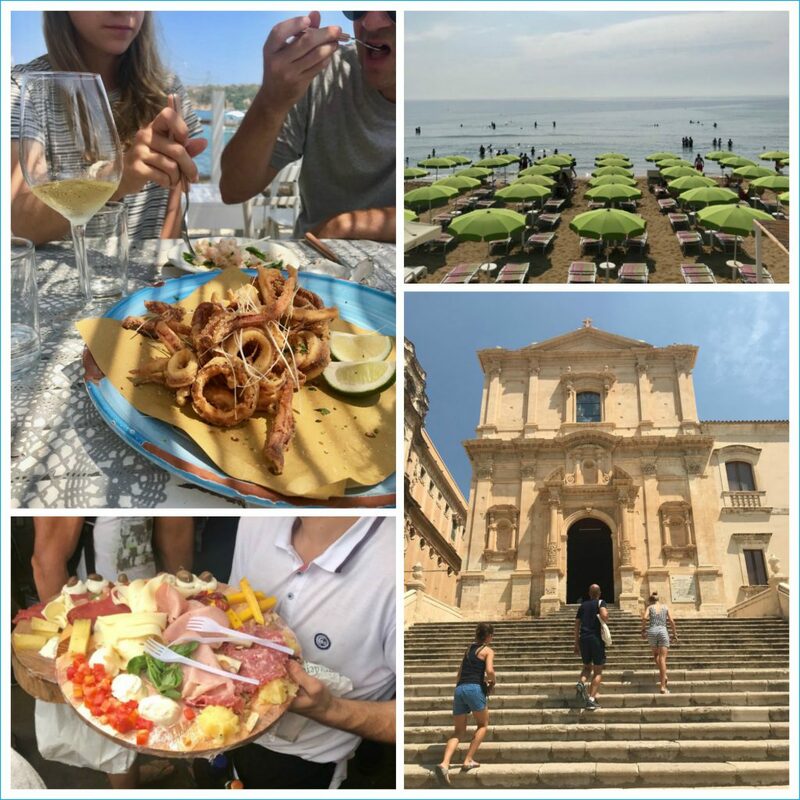 We had an early flight out of Palermo, so stayed in a hotel in Cinisi (20 minutes from the airport) for our final night, driving across Sicily with a lunch stop in Enna. I know it’s hard to believe, but I created this professional looking visual for you all by myself. Our general strategy when booking Airbnbs is to find places that have views or special locations. (To stay within budget, this usually means we make sacrifices — and I use the term “sacrifices” very loosely — on the house itself, whether that’s with space or light or general design and vibe.) This apartment was teeny tiny and we all shared a shoebox-size bathroom, but look at the view we woke up to everyday. We spent a lot of time at the apartment pool. Bellissima! 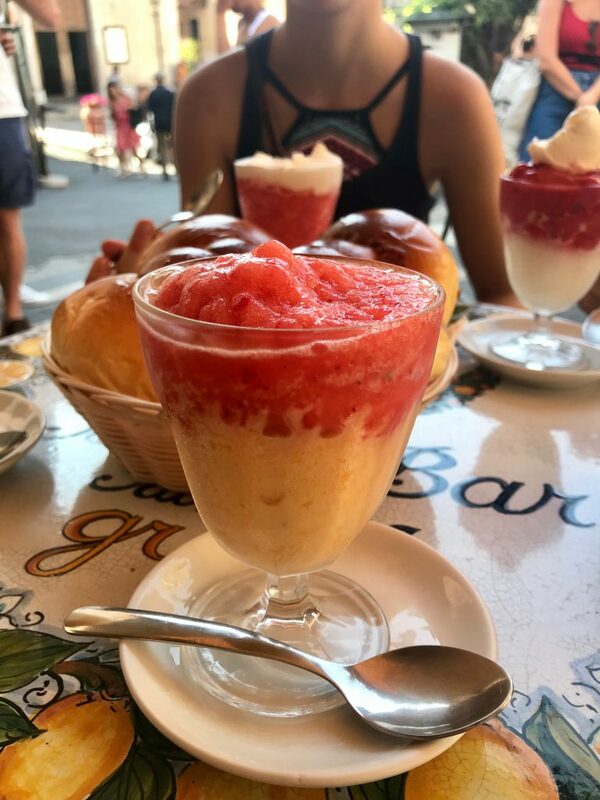 Topping anyone’s list of reasons to go to Sicily has to be the island’s breakfast tradition: A small cup of cold granita (think Italian ice made with the freshest peak-season local fruits) a brioche, whipped cream, and a cappuccino. 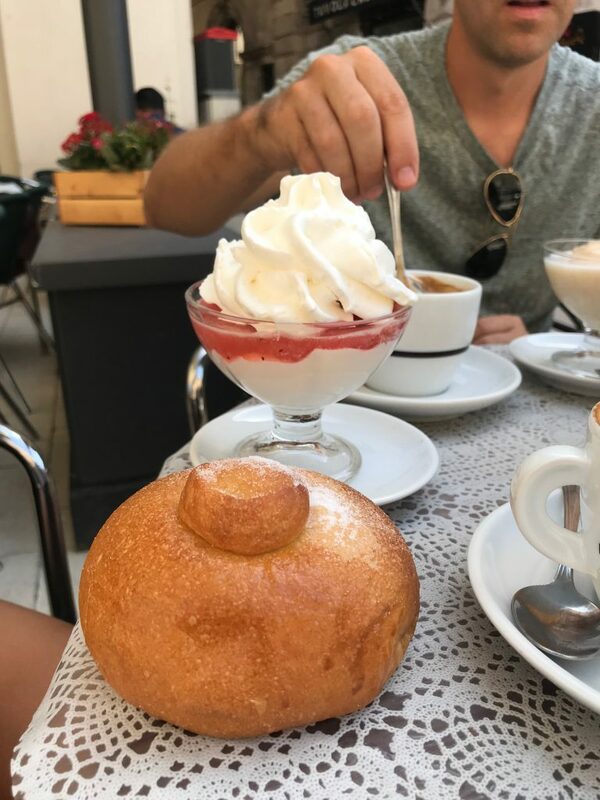 The proper way to consume this is to spoon some of the granita on the brioche, along with the cream, as though it was jam. If it sounds strange to spread something cold and slushy on bread, let me assure you, you get over that fast. 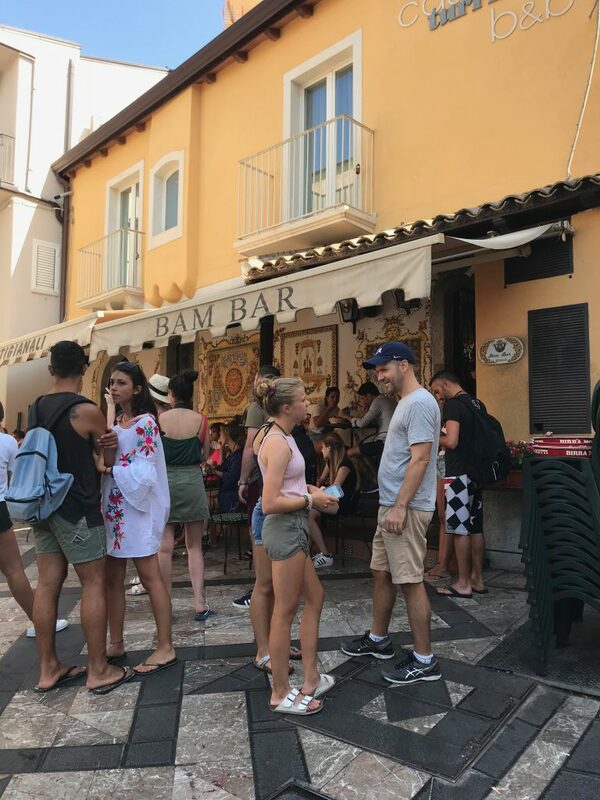 We managed to sit down to a traditional granita breakfast in almost every town we visited, but the winning establishment by a landslide was the amazing Bam Bar in Taormina. (Shown here and in photo above.) Sometimes I wake up dreaming about Bam Bar, with its fruit-themed ceramic tiled tables and its local-institution vibe, complete with jokingly grumpy waiters, long waits, outdoor tables that seemed designed for people watching. Can some enterprising reader out there appropriate this tradition in New York please? 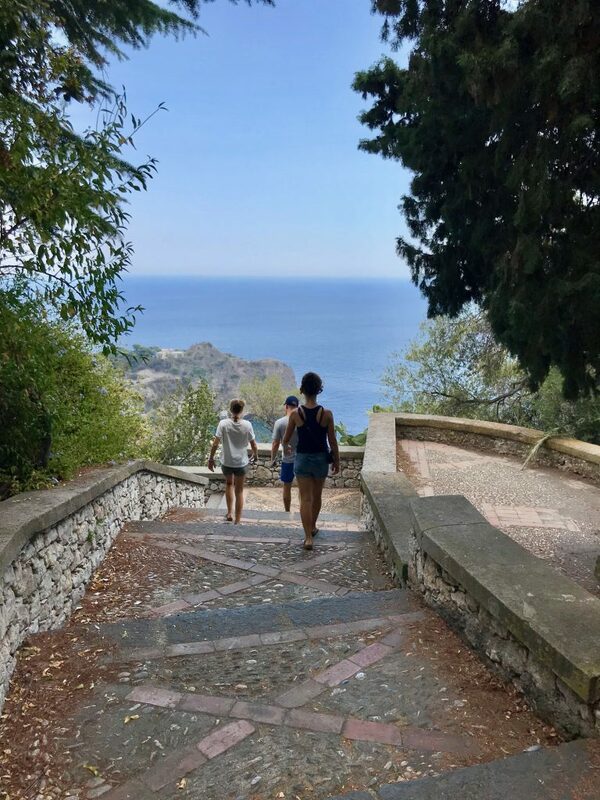 As usual, we did a ton of exploring by foot — Taormina is built dramatically into its ancient hilltop perch, which means that even a saunter into town qualified as a “hike.” This was the crew hiking the steep steps down from Mazzaro to Isola Bella for a beach day. Picture break! P.S. You can also take the Mazzaro cable car back and forth from town to the beach, which is what we did on the way back. Here is Isola Bella, the main beach along Via Nazionale. Not shown: hundreds and hundreds more beachgoers. 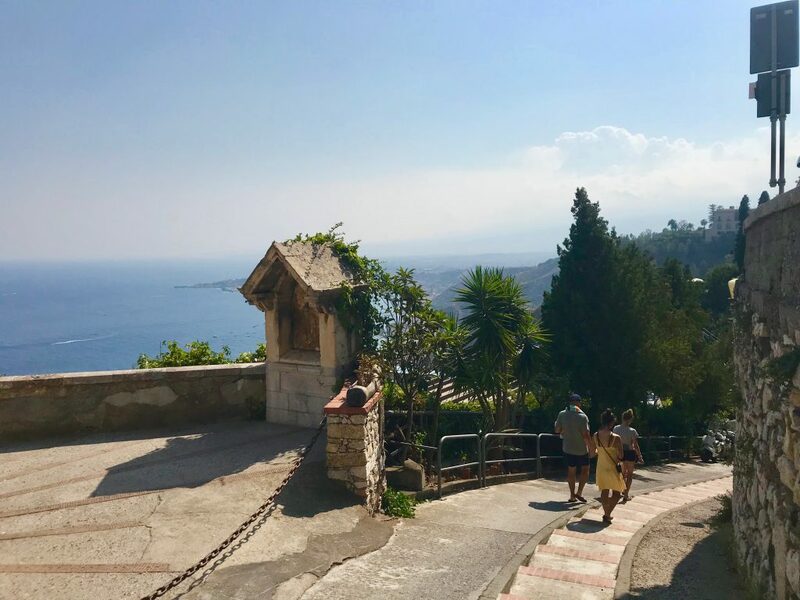 Unlike most of the towns we visited in Sicily, Taormina is touristy, and, with its stretch of beaches, aquamarine waters, upscale shopping, Roman ruins, and impressive array of both street and fancy food options, it’s not hard to understand why. For some reason the crowds didn’t bother me at all, though. Also, hardly any of the tourists were American, which was surprising to me. 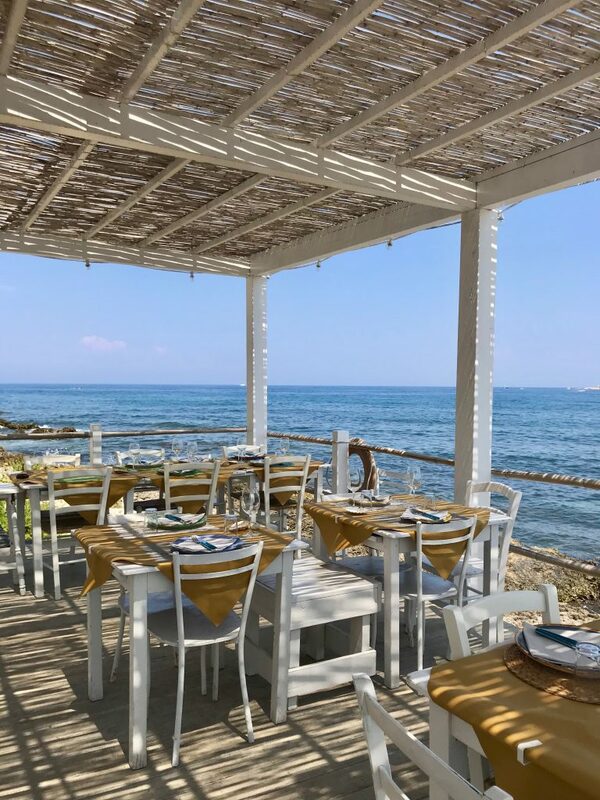 After our beach morning, we had a casual lunch at Ristorante Da Giovanni, one of the many seaside eateries along Via Nazionale. 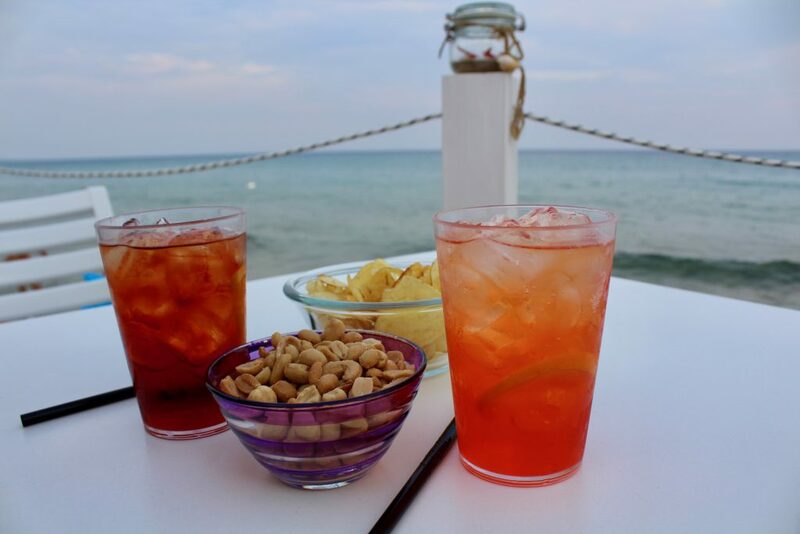 There were two requirements: It had to have views and it had to have spritzes. Turns out, this is not much of a challenge in Taormina. 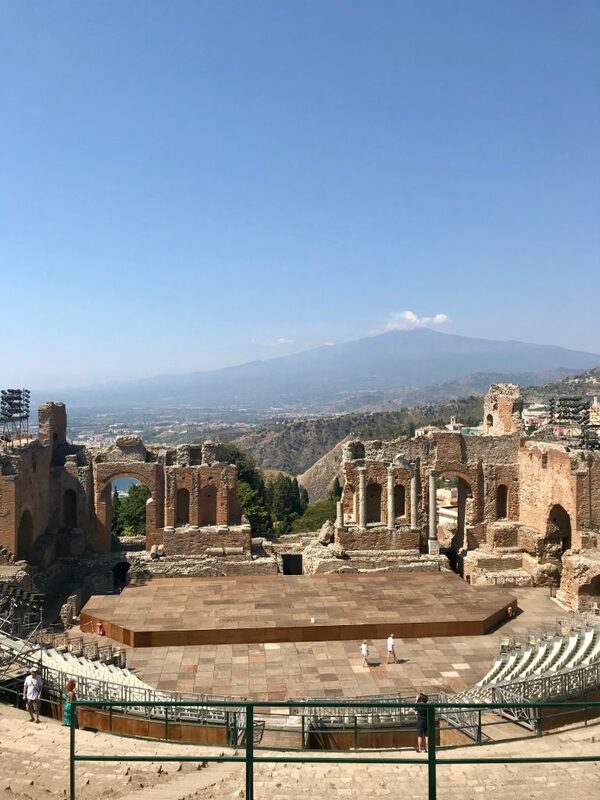 We explored the Teatro Antico di Taormina, one of the biggest attractions of the area. The amphitheater is like a mini Colosseum with an unobstructed view of Mt. Etna thrown in. It was built in the third century BC, by the way. THIRD CENTURY BC! I realized something the other day: I’ve hardly made any appearances in any DALS travel posts, so here I am, on the grounds of the amphitheater, correcting that. Apropos of nothing, my friend Rory gave me this hand-me-down Gap jumper and I wore it pretty much every day of vacation. Corso Umberto, lined with pastry shops, cafes, and boutiquey clothing stores, was the main thread through town. 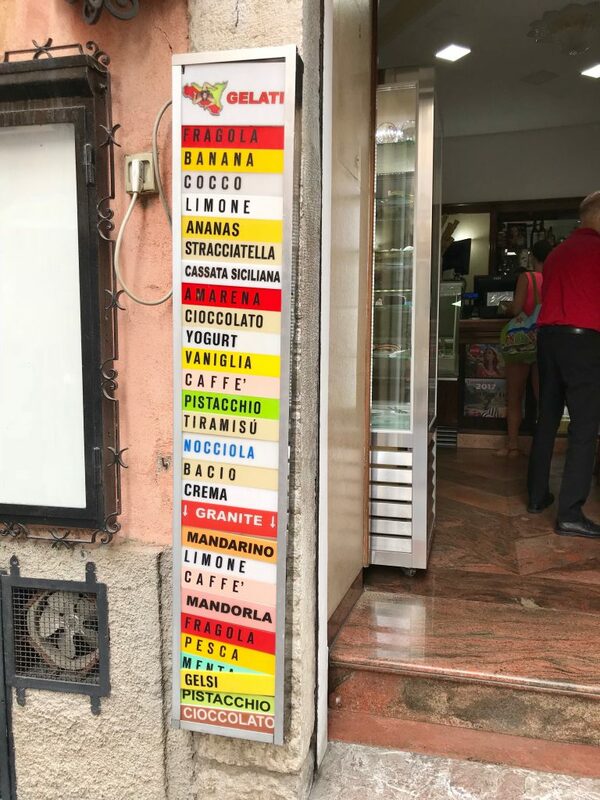 We were definitely not hurting for gelato options in Taormina. Sicily is famous for their lemons and almonds, so those were the flavors we usually stuck with. (Plus I loved saying the Italian word for almond: mandorla.) But there was definitely pistacchio and cioccolato thrown into the mix, too. Abby found a pizza and arancini lunch spot for us on Via Strabone, a quiet, narrow alley off Corso Umberto. It was called Da Cristina and it was insane. 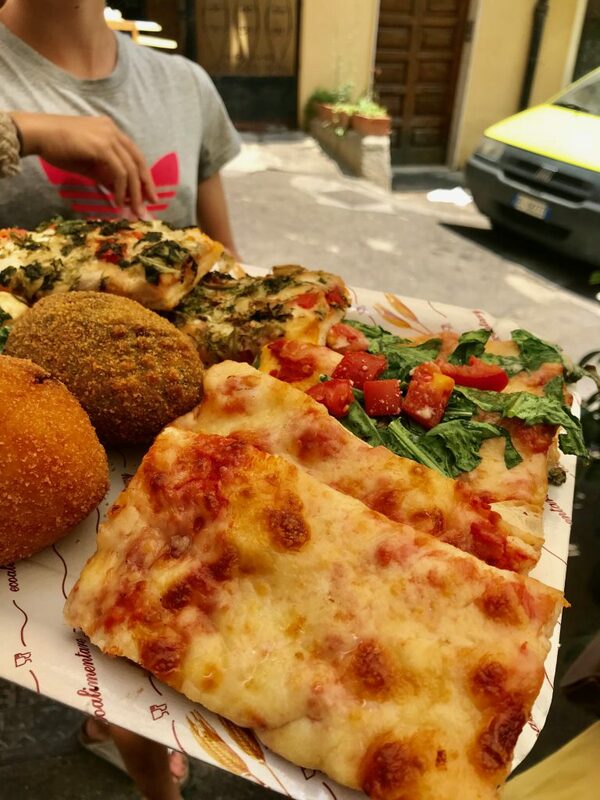 They are known for their arancini — little fried rice balls stuffed with meat or vegetables and cheese, as I’m sure you know — another Sicilian specialty. This was not a light lunch. More walking, more views. That’s the staircase down to our apartment. On our last night in Taormina, we went to Osteria Rosso Divino. 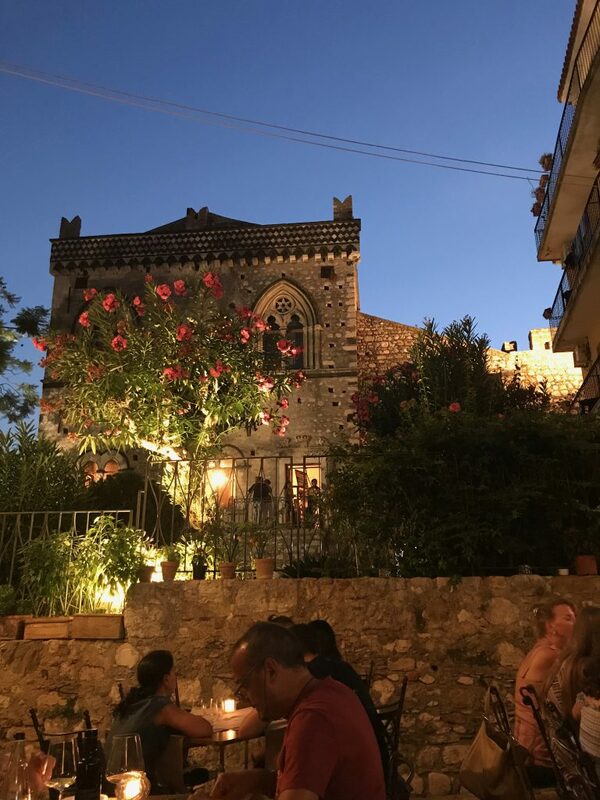 It was pricey, but I couldn’t get over how beautiful it was with the sun setting, and the al fresco dining right beneath a centuries-old church, on a patio draped in bright pink bougainvillea. I think I declared it the best restaurant on earth before I even had a bite of the just-caught snapper and a glass of the local Etna Bianco. Good grief, it’s hard to imagine life getting better. 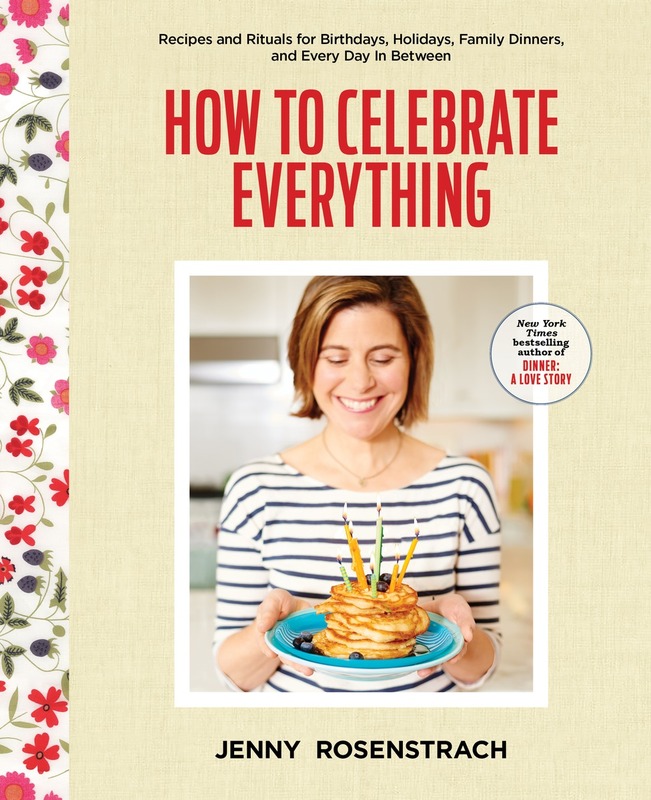 You can (and should) make reservations. For the second leg of our trip, on our way down to Avola, we made a lunch stop at I Rizzari, in the small seaside village of Brucoli. I feel like the photos alone show you how magical this cafe was. 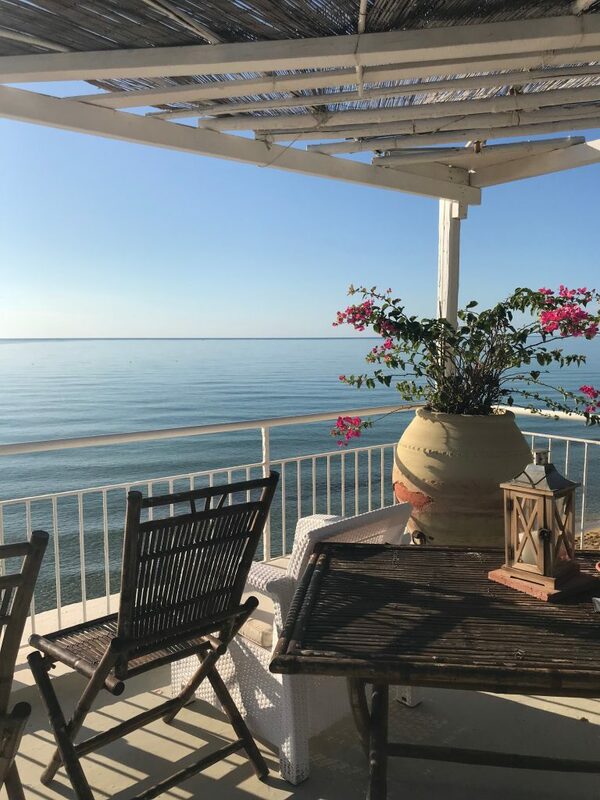 Picture yourself sitting there, chasing down lightly fried calamari with a cold glass of white wine on the sun-dappled patio (that thatched roof! ), feeling a light breeze while listening to the water splash up against bright red and blue fishing boats. …this was the view from the deck. No, this is not a painting! And another one. Do I even need to tell you how well we cocktailed that week? The light in Sicily was ethereal. Not just from our patio, but all over the island. It didn’t take us long to find our granita-and-cappuccino spot: Bar Girlando in Avola. We were most certainly the only tourists there. Everyone else looked like they’d been sitting at the same table ordering the same thing for centuries. The best part about staying in Avola was its proximity to Noto (above), Siracusa, Ortigia, Ragusa, and Modica to name a few. It was the perfect launching point to explore the southwest part of the island. 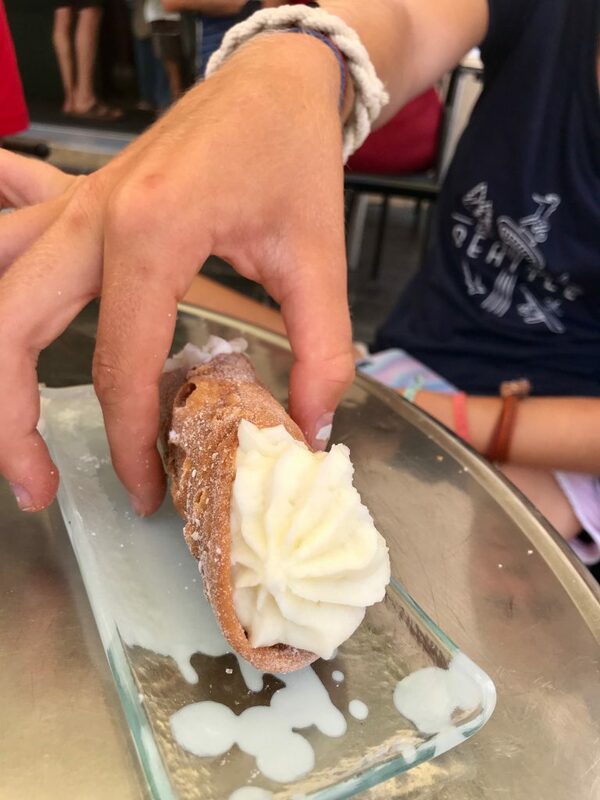 Also in Noto: The legendary Caffe Sicilia, made famous by the Chef’s Table episode focusing on the longtime owner Corrado Assenza and his dreamy gelato, cannoli and cassata, beautiful little sponge cakes topped with candied fruit. Needless to say, we spent a lot of time there. Phoebe ordered an almond milk latte one morning and maybe it’s just that we are used to the store-bought cartons that taste like substitutes, but this one tasted like actual almonds…like liquid marzipan. “It’s not a special thing to know how to produce quality,” Assenza says in the documentary. “It’s what we know how to do.” Man do I love Italy. 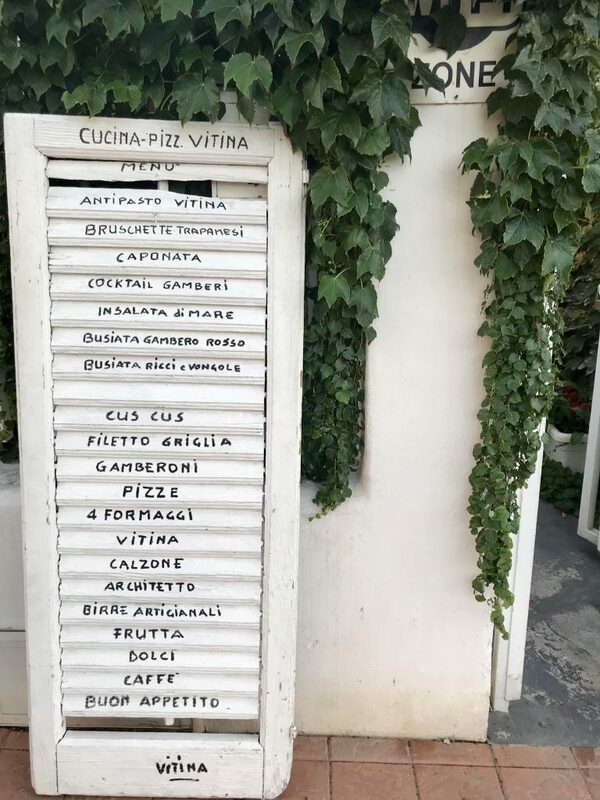 Side note: Not exactly an insider travel tip here, but one of my more favorite things about Italy, whatever town we were in, was how handspun and charming all the signage was. 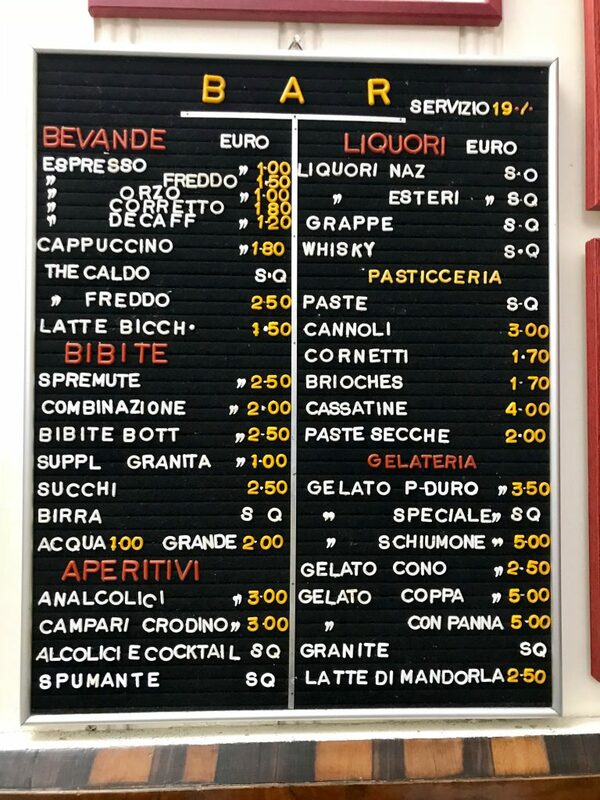 This was the menu at Caffe Sicilia. And this was the price-tagging at Veni a Tastari, an unbelievable sandwich shop in Avola. 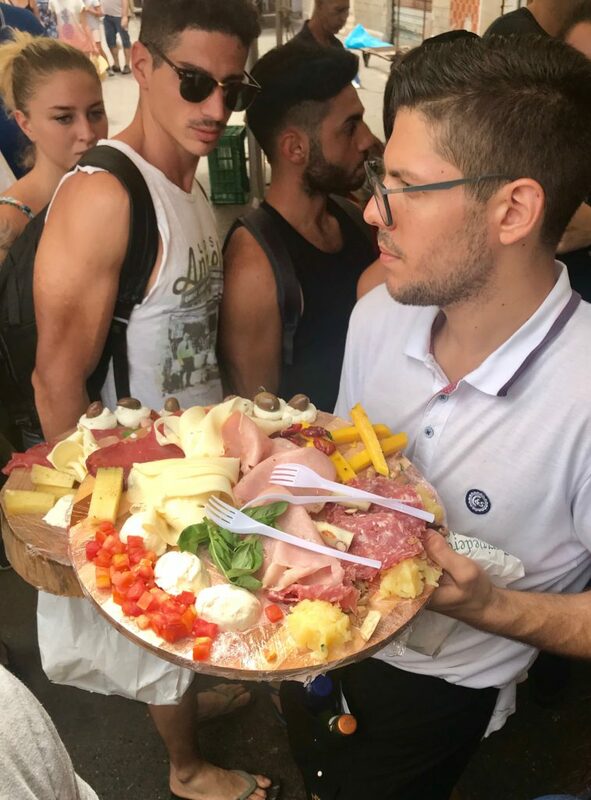 (PS: I just asked Abby how she found this place and she said “You know, you should tell people to use Bon Appetit and Traveler and all those great websites, but you should also just google “food near me” and look at the pictures that come up because it’s Sicily and you can just tell.”) Get the bologna and pickled vegetable sandwiches. 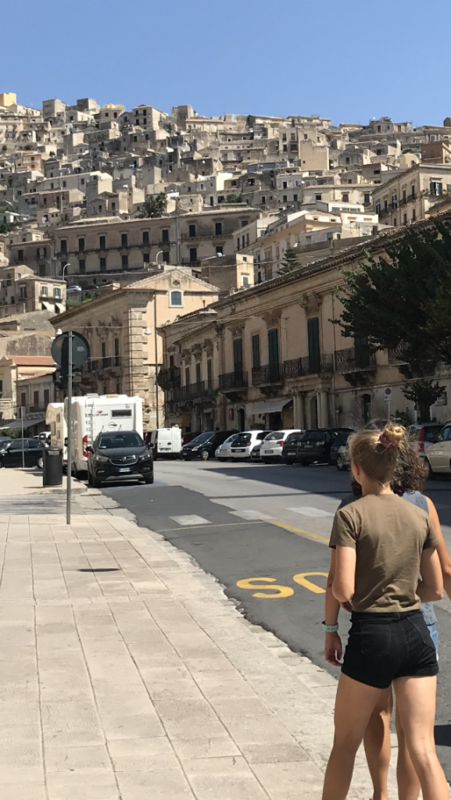 We spent a morning in Ragusa and on the way stopped in Modica (shown) famous for its chocolate and its beautiful Baroque Duomo di San Giorgio. We loved Ortigia, the historical center of Siracusa, which was on an island accessible by bridge. 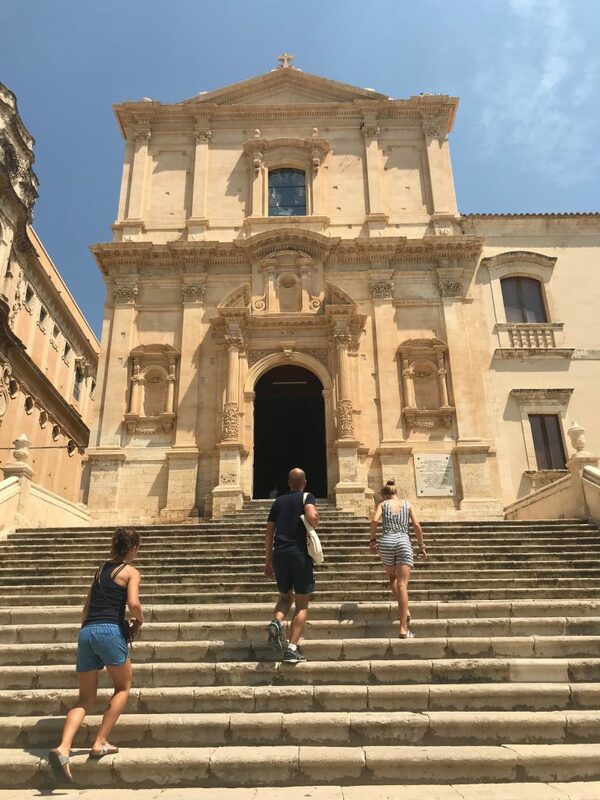 This entire region of Sicily area was destroyed by an earthquake in 1693, but the Baroque towns and cathedrals that emerged from the rubble, like the Duomo di Siracusa, shown here, are jewels. It dominates the main piazza of Ortigia where we spent a lot of time sitting on the steps and people watching. 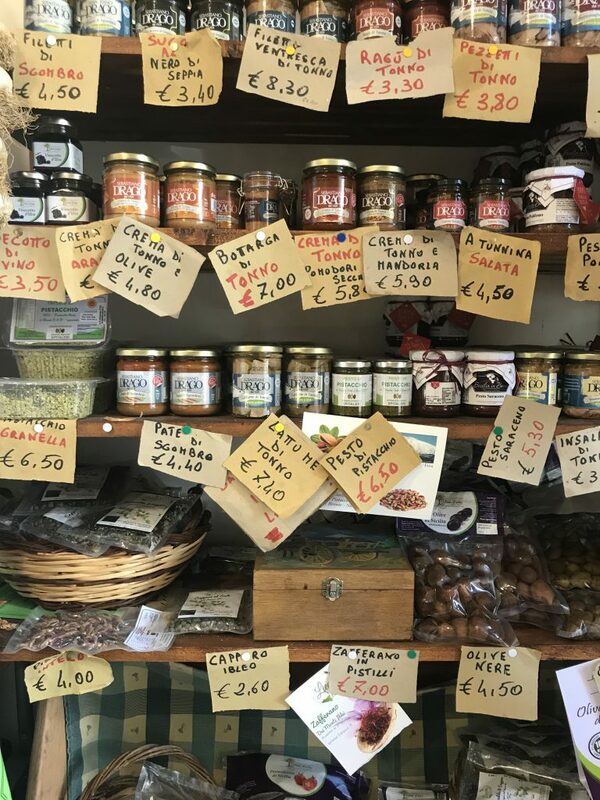 Ortigia is also famous for its historic open-air market where you can find all you’d expect by way of local treasures: seafood, produce, nuts, herbs, breads, oils, cheeses. I wish I could tell you more about it but we spent so long waiting in line to eat at the famous Borderi sandwich shop (shown) a few doors down that the market was closed by the time we got there. (I think it’s open Monday through Saturday, from 7:00 am to about 2:00, so go early!) Yes, the sandwiches are amazing, but count on a long wait. 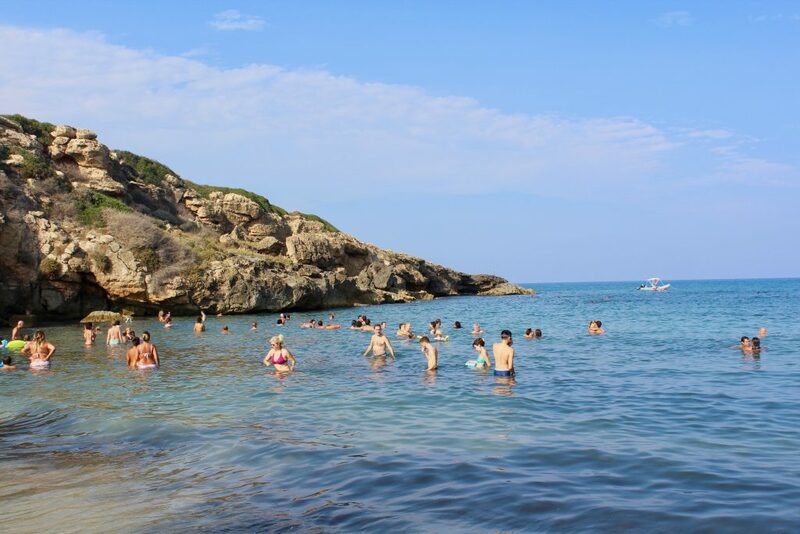 What I loved most about Sicily was that you could spend a morning gaping at frescos in five-hundred-year-old cathedrals, then spend the afternoon hiking and swimming…or both. 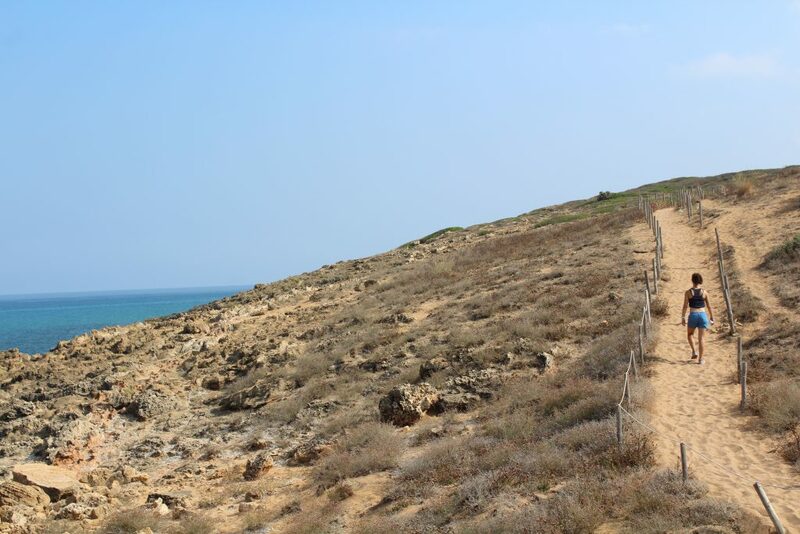 This was the hike to Calamosche Beach, which started at Beach Eloro. Even though the trail to the beach was relatively flat, it felt way more arduous because of the deep sand and the intense late afternoon heat. But what’s that they say about pain and gain? Calamosche Beach was stunning. One of those swims that feels like a baptism — just completely rejuvenating. 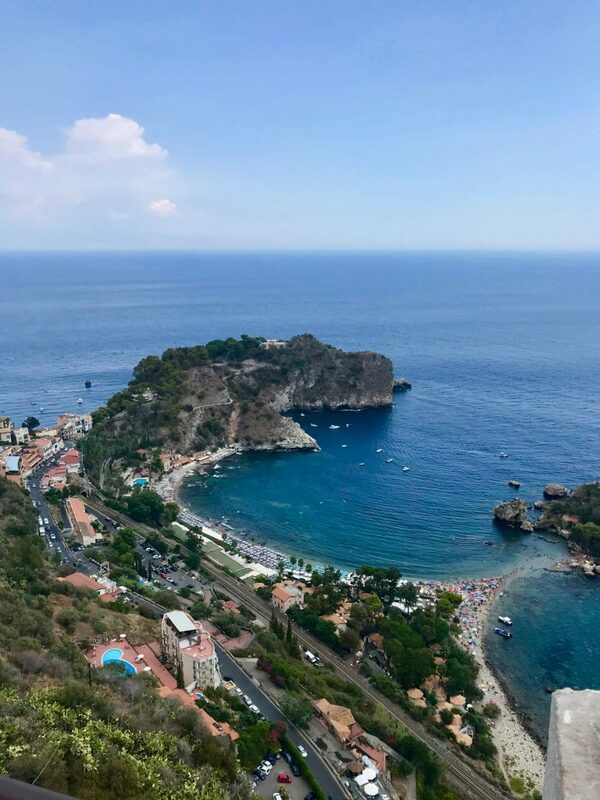 One morning, over granita and cappuccino at Caffe Sicilia, we were trying to figure out what to do in between breakfast and lunch…and ended up just driving right to lunch, even though we were still wearing running clothes. (I know, so American.) 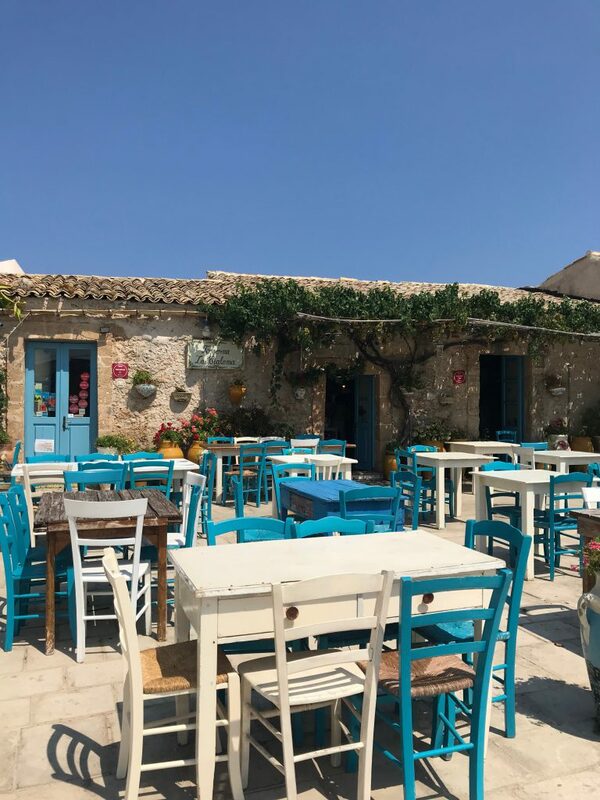 We drove to a little fishing village called Marzamemi, about 17 miles from Avola, primarily because we wanted to eat at Taverna la Cialoma (above and below), another charming seaside restaurant we read about in a bunch of magazines. I imagine if I describe every restaurant as the best place I’ve ever eaten that I’m going to lose what’s left of my credibility here, but, well…I wanted this lunch to last forever. The bright aqua chairs and the bougainvillea, and the fish which might as well have been caught from a line right to our table. I wish I took a photo of the anchovies we ate, they tasted like the sea, drizzled in a beautiful rich yellow olive oil. So simple, so perfect. 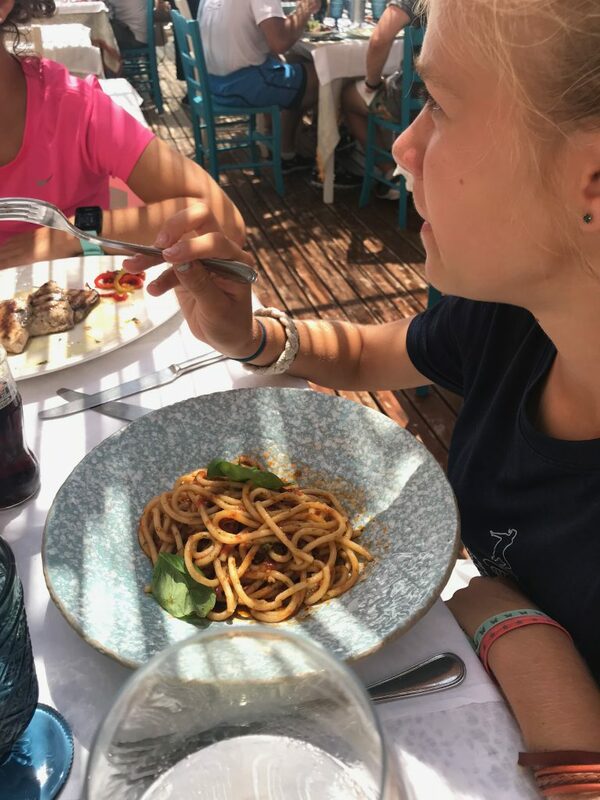 I can’t remember exactly what kind of pasta Abby is eating here, but does it even matter? We didn’t eat out for every meal. 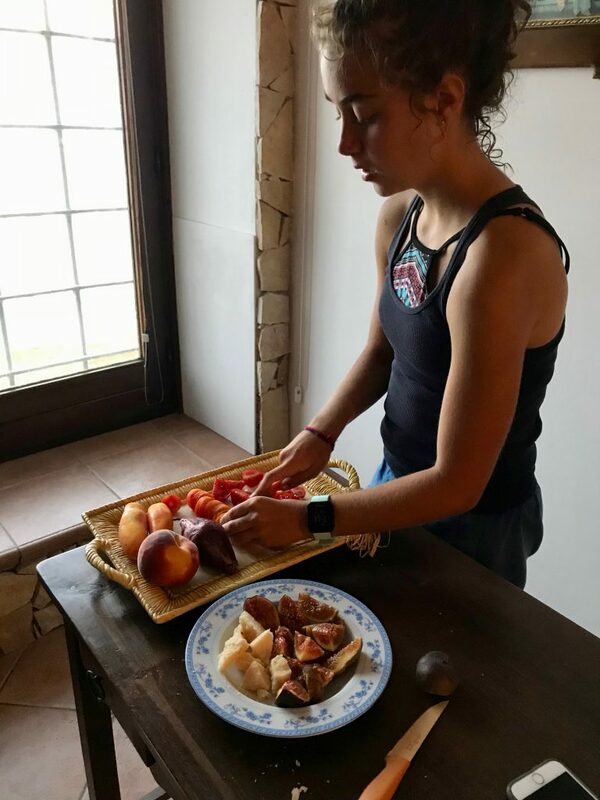 Here’s Phoebe prepping some tomatoes for her favorite bruschetta topping: peach and tomatoes. I stole a few of her tomatoes and tossed them with shrimp and pasta for dinner. 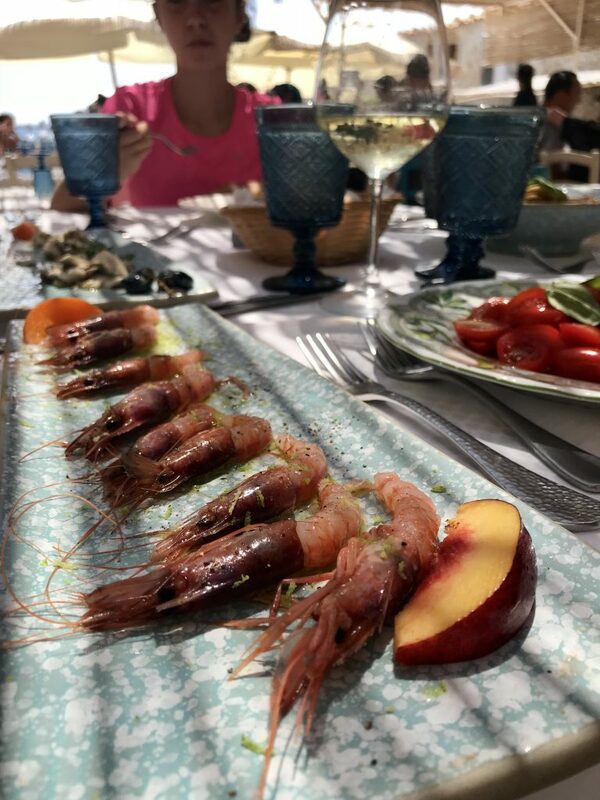 (We got all our seafood at the Pescheria Fili Spugnetti, near the marina in Avola.) Don’t the figs and Parm look like a Renaissance still life in that light? There was a little cafe about 100 yards from our house where, naturally, we felt the need to treat our deprived selves to some spritzes. We found a great running route along Via Sandro Pertini, a boardwalk-y road that paralleled the water and was dotted with beach clubs. This one was called Lido Eden. On our way back to Palermo for the flight home, we stopped in Enna, smack in the middle of Sicily to have a picnic (sandwiches we brought from that shop in Avola). This was our view of the next town over. Doesn’t it look exactly like a Bruegel painting? For mythology fans out there, Enna is the place where Persephone was taken by Pluto and sent to the underworld. And that is how we found ourselves ordering half the menu on our last night in Italy. Does anyone know how to say “we left it all on the field” in Italian? 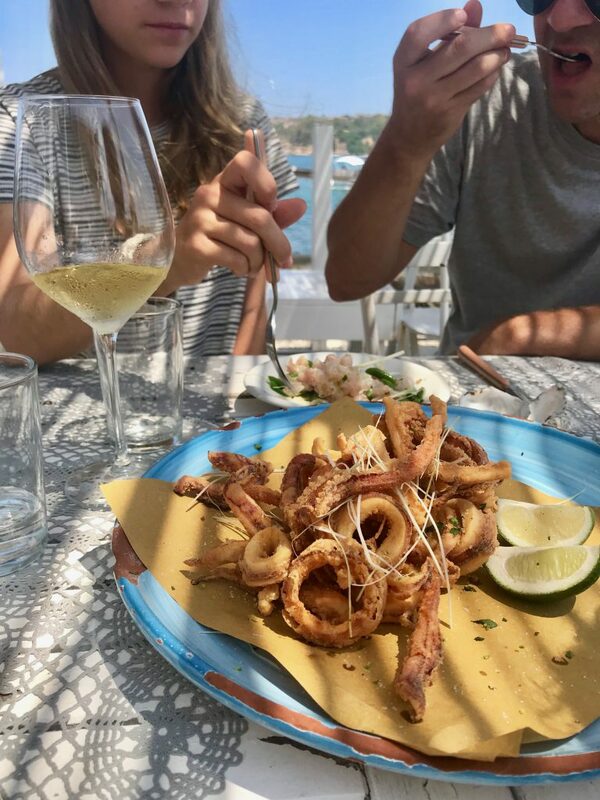 That’s what we did — at the restaurant and in Sicily. Now go plan that Big Trip! Related: 18 Summers: The Ultimate Guide to Not Wasting a Single Summer with Your Kids. Okay, that food looks epic! That said, it’s so funny reading this as a North American expat based abroad. For us, summers are the complete opposite. Summer is when we fly my little kid back to North America to: eat bagels and cream cheese, roast marshmallows over the fire, run around our (former) local community center with the kids she has known since she was a baby at day camp, picnic on actual grass, go to Costco (important cultural experience!) and just generally be an every day North American kid. thank you for the wonderful post. My grandfather and my mom’s mothers side of the family all came from Sicily. I can’t wait to make a trip there. Then it’s on to Norway to see where my dad’s family is from!! Andy’s mother has roots in Sicily, too. 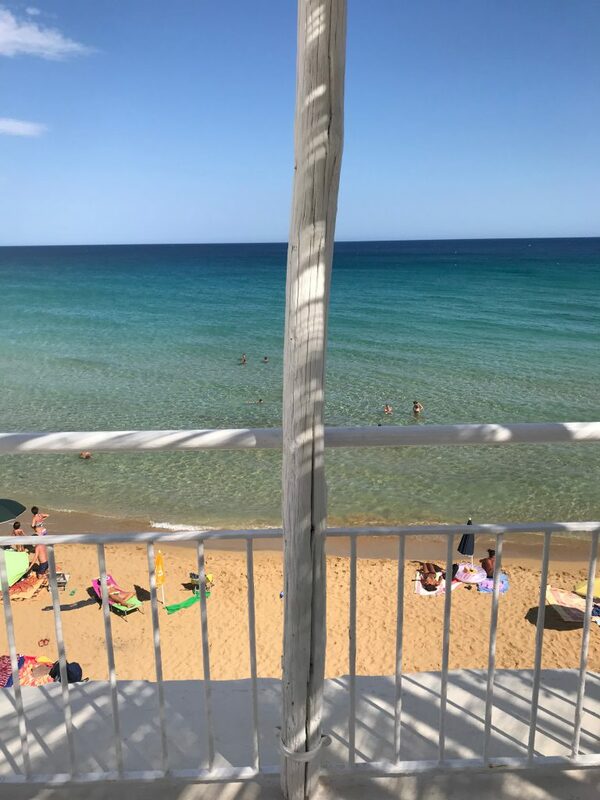 In Sciacca — unfortunately didn’t make it there! Just curious, about how old were your kids when you started planning big trips? About 8 and 10. It didn’t seem worth it to spend the money on a big trip if they weren’t going to remember any of it. Wow, congrats! Yes, we mostly stuck with beach vacations when they were little. I didn’t have any desire to tour a Baroque cathedral or go to museums on vacation during those years. I don’t know where you live, but Block Island was a lifesaver for us back then. We went three summers in a row. Thanks for your quick reply, that’s helpful! 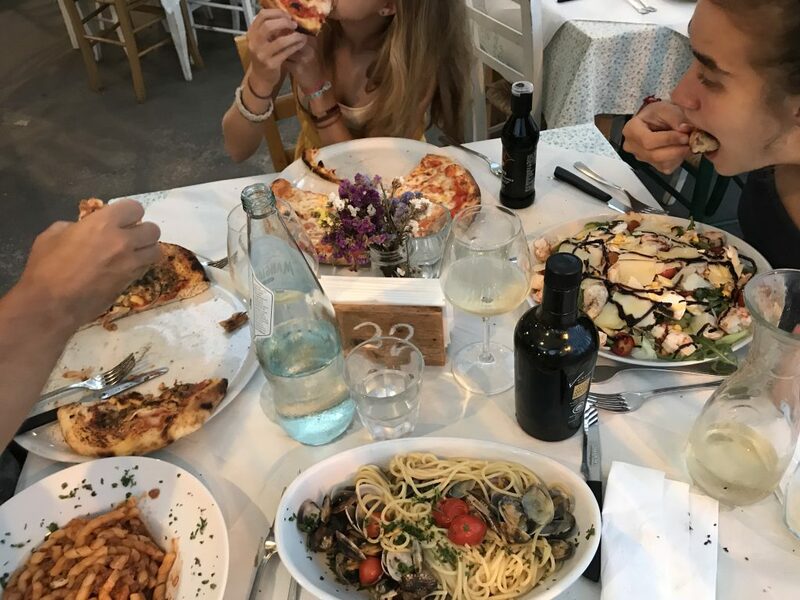 Was it difficult to find vegan fare for your kiddo in Sicily? What a beautiful trip, thank you for sharing. You might have my kids confused with someone else. No one is vegan in my house. Having said that, it would’ve been manageable, but not ideal. The best things we ate were the seafood, gelato, and pizzas. But in August the produce was spectacular and if you’re doing your own cooking and in control of things, it wouldn’t be hard. This has me dreaming of summer travel here in this crazy NY cold! Seeing how well you travel with your teens has me excited about future travels when my girls are older, too. 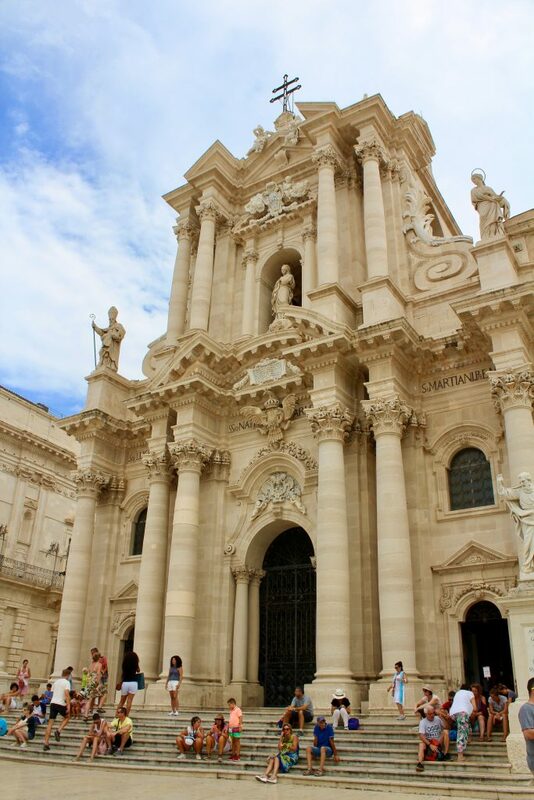 We honeymooned in Sicily in late December/early January, spending New Year’s in Siracusa. 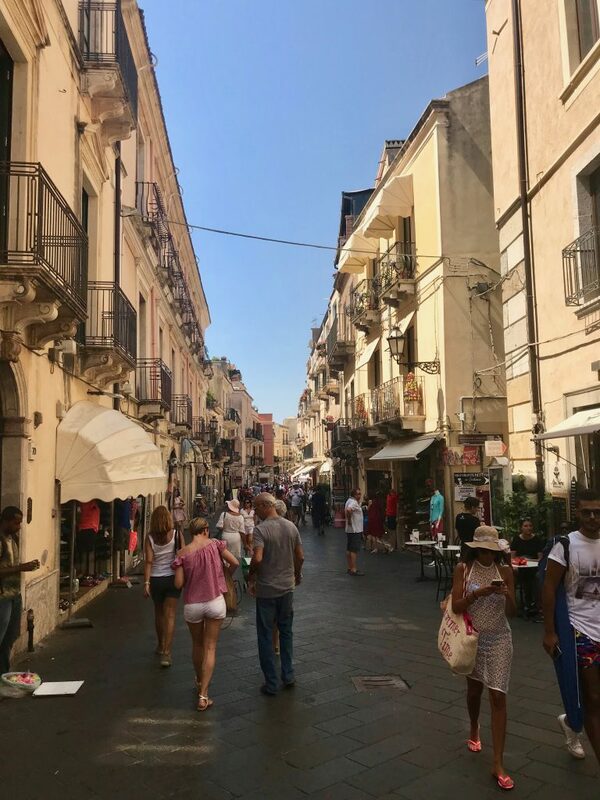 We spent time in Catania, Siracusa, Ragusa (and visited Modica and Noto too), Agrigento for the Valley of the Temples, and Palermo. It was a dream! I love this write up, it makes me want to go back in the summer. The food, the history, the people, the architecture, the light…one of the very best trips I’ve ever taken! What an absolutely lovely trip -thanks for sharing! And for the inspiration! This trip looks absolutely dreamy! 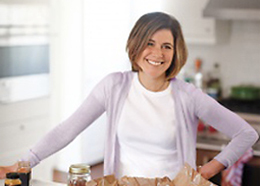 Question— do you or your husband speak Italian? I’ve only ever been to Rome, which was easy to get around without speaking much, but I always wonder if the language barrier is greater in other cities. Don’t speak Italian, but we armed ourselves with google translate and did a lot of pointing. Everyone there was so nice, it really wasn’t a problem. 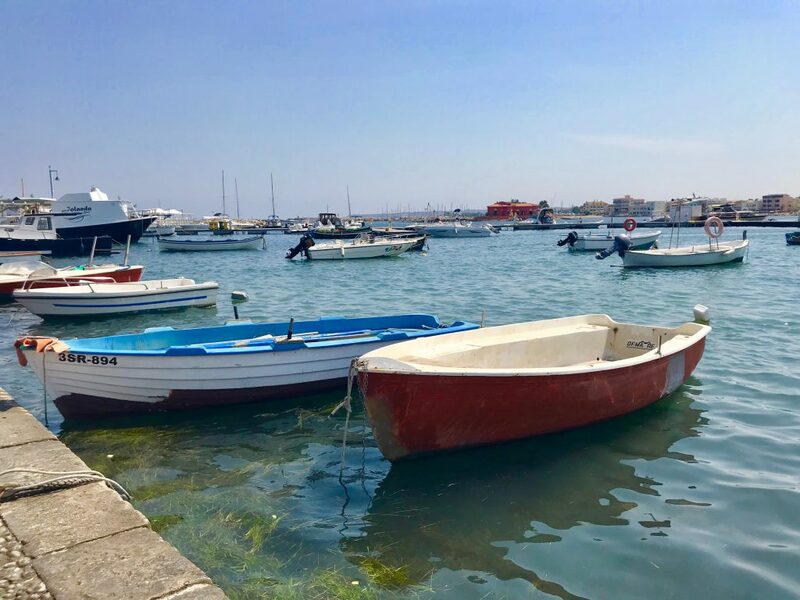 I think I fall more in love with Sicily every time I go there – and I’ve been there every year for the past six years, and twice this past summer alone! 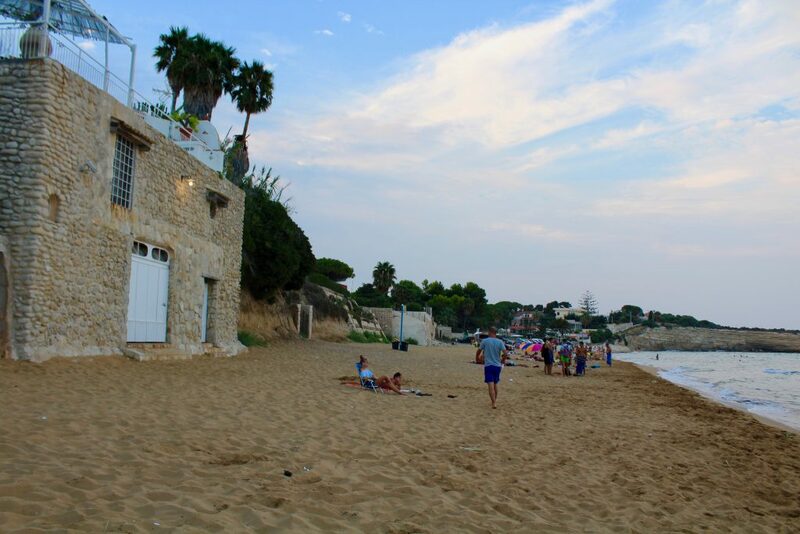 The food, the sights, the beaches… everything just keeps me wanting more and more. When you make it back there, I highly recommend spending at least a couple of days on the island of Favignana. It’s paradise, in a totally un-manicured, un-pretentions way (think: Bikes to get everywhere, sun-baked architecture, rugged coastlines, THE most spectacular water ever). These photos made me swoon.My husband and I just booked our trip to Italy-we’re staying on the island of Giudecca in Venice for 3 days, 4 days in Florence, and 4 days in Rome, in a neighborhood not far from Vatican City. 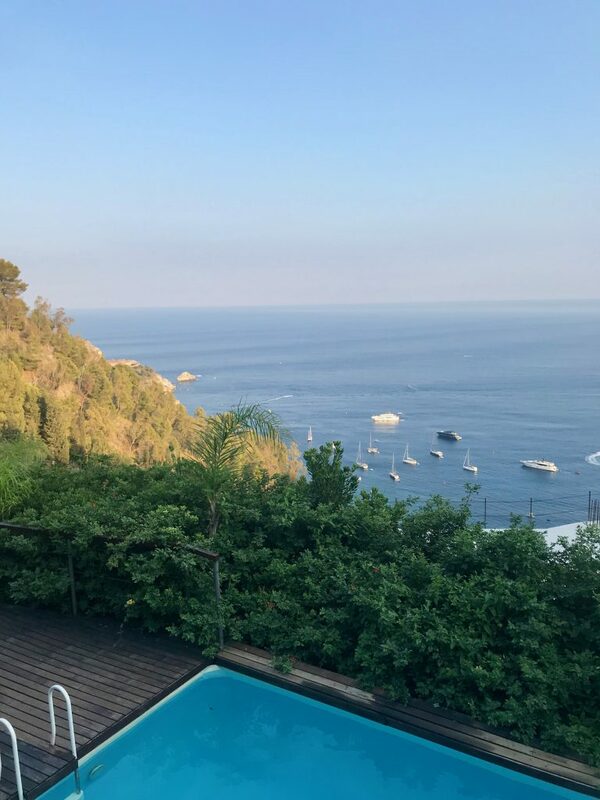 The Airbnbs all have incredible views, all I plan on doing is walking and gawking and drinking spritzes and eating the best food of my life. 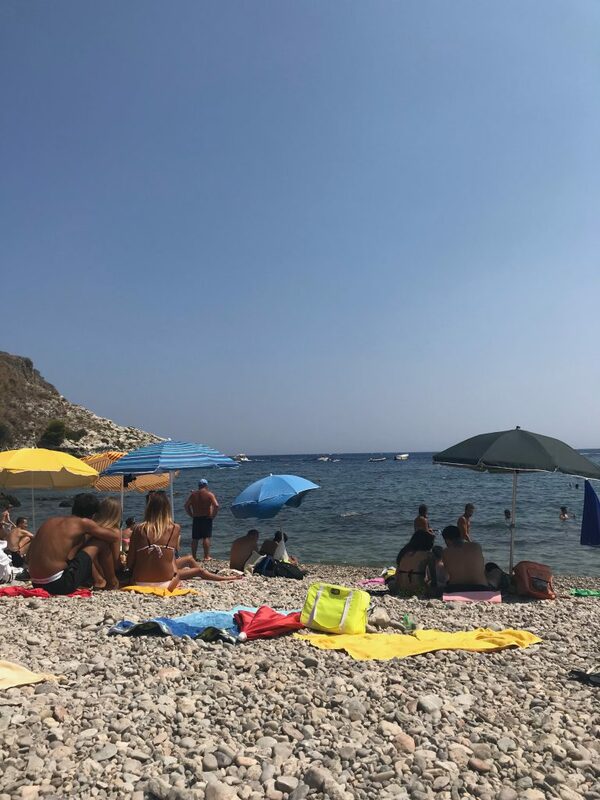 Of course this post has me rethinking everthing so we can go to Sicily, but I have a feeling that you can’t go wrong with any place in Italy. Thank you so much for this beautiful recap! 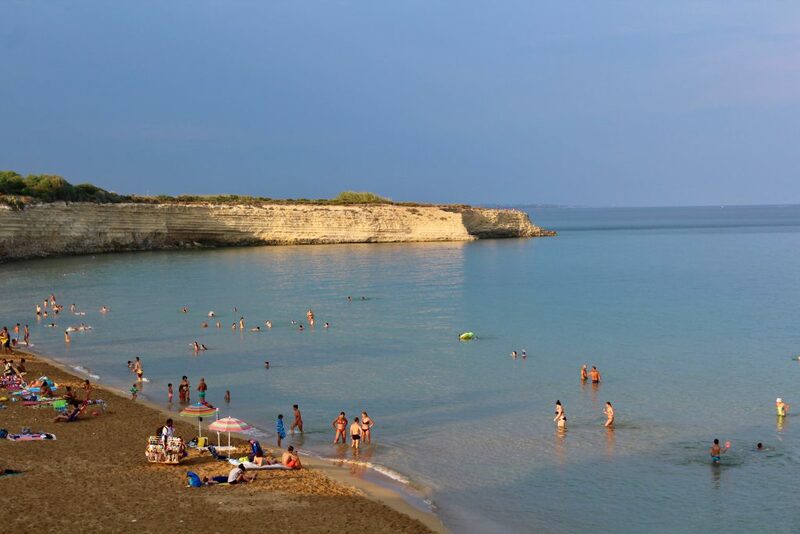 Am thinking of doing an extended Sicily honeymoon and have heard that one must have a car to explore the island but have heard varying reports on the safety of driving / best methods to rent a car. If it’s not too much trouble, could you share how you found the driving conditions and how you rented your vehicle? We are planning a trip to Italy in September. Did you do all your own planning? We are inexperienced at oversees travel and wonder how to get it to all come together. Beyond the initial dreaming, how did you approach the planning of your trip? Great read. Loved the pictures and the prose. Thanks for giving us all a little vacation in January. Thank you for sharing your family vacation photos with us. I visited Italy for the first time last June for my best friend’s wedding, alone, no kids! Three days in Rome alone then a couple days in a small town in Umbria with my friend and her lovely guests. 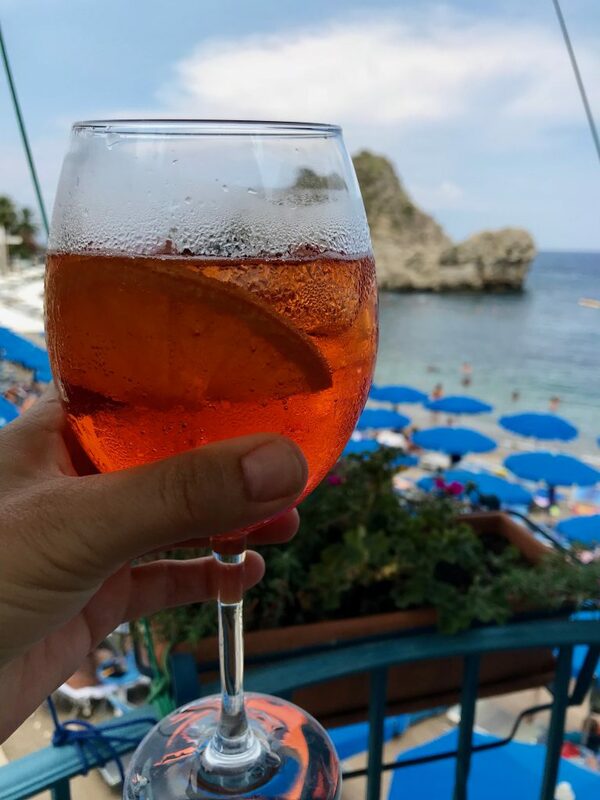 As soon as I saw the photo of the aperol spritz, my heart did a little flutter. I love how they are pronounced “spreeetz” in Italy, and it’s something my friend and I text to eachother when we are missing each other and that glorious trip. “I miss you and I need a spreeetz” (she lives across the country from me). Thanks again DALS! I just drooled over these photos. Beautiful. I just love your trip recaps, Jenny! Do you happen to still have the link to your Amsterdam airbnb? It looks lovely! Very inspiring! I’m about to plan our summer vacation to England and finding it completely overwhelming. 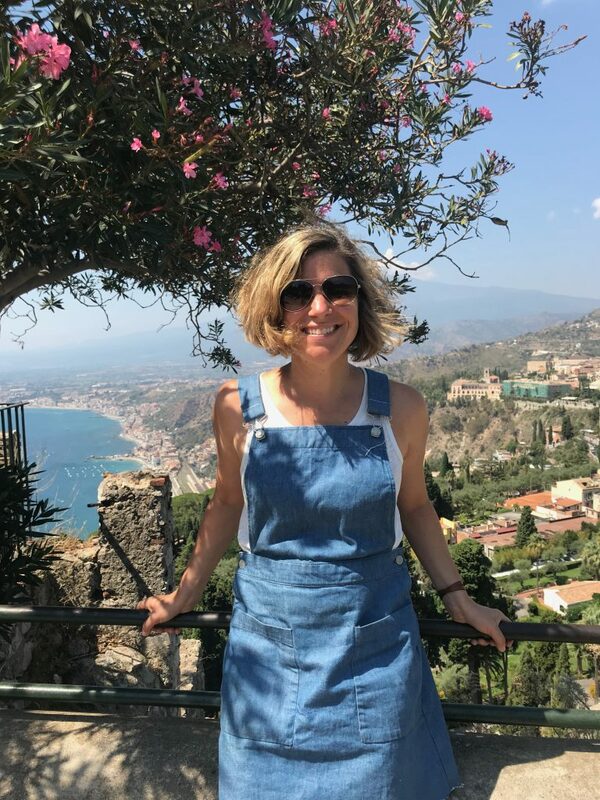 We went to Italy in 2017, using a travel agent and Rick Steves guide (Rome, Sienna, Sorrento). My overarching plan is to travel internationally with my son and husband on alternate summers. So this year is London, Cotswolds/Bath, and Cornwall. Any tips are most appreciated! 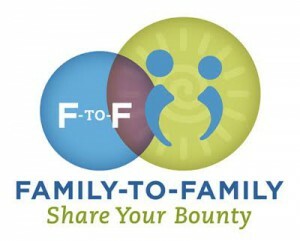 When my youngest turned 3 and we could get someone in our family to watch our kids for a week my husband and I have been going somewhere every summer by ourselves. I start planning in the cold, hard, dark days of January as well and researching and thinking about where to go is half the fun. The first time we went to Paris because we didn’t know if we could ever do it again so we decided to go big. It is so great to build memories that he and I have and remember that we got married because we have fun together. Italy has been on our list forever! The last several times we have booked small day tours–in London a rock n roll walking tour, in San Juan a food walking tour, and in Little Havana a food walking tour. A couple hours and you meet people and learn something. Really recommend them. Hello! 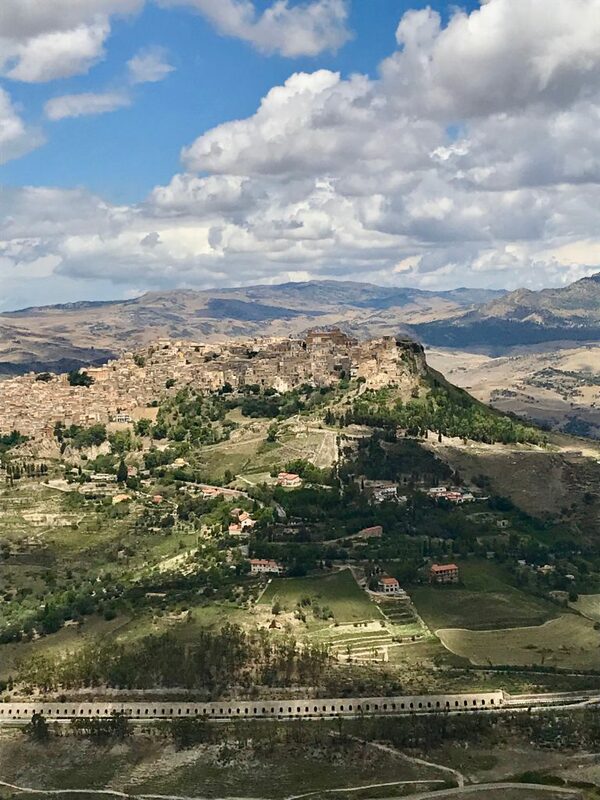 This is an incredibly timely post since I’m visiting Sicily in June. Wow, I can’t way to dig into all that amazing food! Would you mind sharing which Airbnbs you stayed at? We are currently looking for accommodation options and any tips would be very much appreciated. Thank you so much and ciao from Portugal! What an amazing trip! I always drool over your trip recaps, and now I get to drool while I plan! 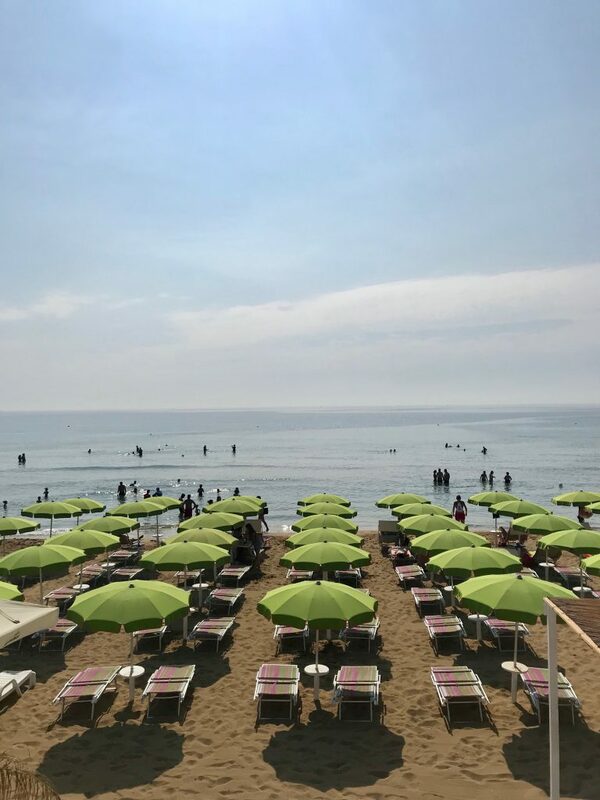 We are going to Sicily (through Rome) this July with another family (including 4 teenagers), and so was very excited to see this post! We will be doing the mirror image of your trip, exploring the western part of the island, but this makes me look forward to it so much. We are also spending a few days in Rome, so my next stop is your Rome post. Thanks for putting this together! I appreciate how much you remind me of what is important in a family vacation – not just going to lots of historical sites, or lying by a pool, but also just being together eating and exploring. Plus, granita breakfast? Are you kidding me? ?